Perched above lake Albano, 20 miles south of Rome, is a small town of Castel Gandolfo. A favourite retreat of the rich and powerful in the days of Roman Empire, Castel Gandolfo later became the papal summer residence. The views from the town over the lake and surrounding countryside inspired many artists who visited the area on the Grand Tour in the XVIII century. Although Pope Francis, a fervent advocate of frugal living, has yet to spend a night in the luxurious abode, many pontiffs over centuries came to the residence to take a break in the Alban Hills from the hectic life in Rome. The Pontifical Villas of Castel Gandolfo comprise about 135 acres, more than half of which make up a stunning formal garden, Giardino del Belvedere, that Pope Francis opened to the public last year. Visitors can admire manicured lawns, ornamental flowerbeds, stroll in a park under shady holm oaks and explore the glorious first-century AD ruins of Emperor Domitian’s country residence. 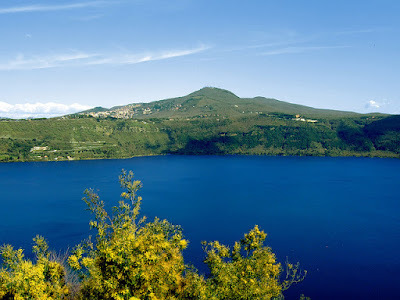 The pretty town is clustered around the Papal Palace with some spectacular views over Lake Albano. 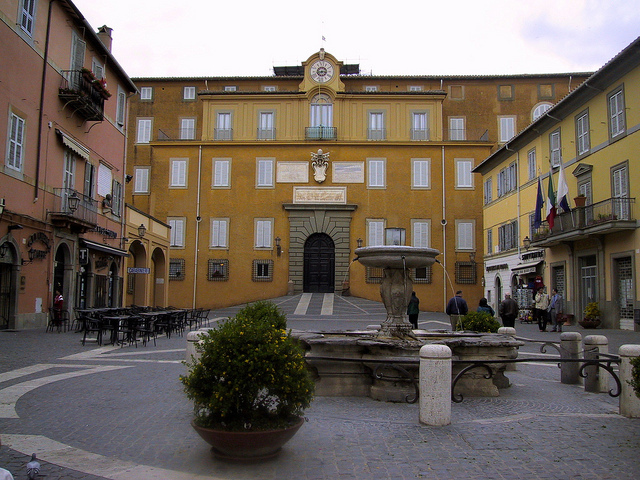 On the main square, Piazza della Libertà, stands the Church of San Tommaso di Villanova, designed by Bernini. There are many splendid palaces built by noble families in the past, however, the best way to enjoy Castel Gandolfo is to get lost in its picturesque alleyways and absorb its small-town atmosphere. And, naturally, sample excellent local food! The area of Castelli Romani is renowned for it wine, roasted pork meat called “porchetta”, strawberries and peaches. Book a table on the panoramic terrace at the Ristorante Bucci to enjoy lake view while sampling delicious local dishes. Follow in steps of such Hollywood celebrities as Robert De Niro, Nicolas Cage, Catherine Zeta Jones and head to Antico Ristorante Pagnanelli for a romantic meal on their beautiful terrace or wisteria-scented garden. The restaurant is famous not only for their quality food but also for recently restored ancient wine cellars where themed dinners are often hosted. Photos via Flickr by: Giampaolo Macorig, Allan Doyle.